Vegetable seller spent two years removing rocks to build path; government promises to reward it and complete the work. For two years, 45-year-old Jalandhar Nayak used a hoe and a pick to build an 8-kilometer road alone in a remote village in the Orissa state of India. The vegetable vendor worked about eight hours a day to remove the stones and clear the way, in order to reduce the time spent by the children to get to and from school, located 15 km away. The three children used to take three hours each way on mountainous terrain. "My children had difficulty walking down the narrow, rocky path," Nayak told the local News World Odisha newspaper. "I often saw them stumbling on the rocks, so I decided to sculpt a road through the mountain so they could walk more easily." There are still 7 km of road to Nayak to complete its work. But the local press interview drew the attention of the Indian authorities, who promised to build the rest of the way and reward the seller for the work already done. The news made Nayak "very happy" - he took the opportunity to ask for electricity and drinking water for his village. According to the Indian press, only the Nayak family live in the region - abandoned by other residents precisely because of lack of infrastructure. "I was impressed to see that he was extremely careful (in construction) and made sure no tree was felled to build his road," said Sibashakti Biswal, the first reporter to interview Nayak. 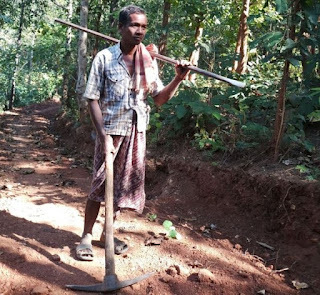 The press has compared Nayak to Dasharath Manjhi, known as the "mountain man of Bihar," who spent 22 years (from 1960 to 1982) building on his own a road that crossed mountains and connected his village to the nearest town. The purpose was to prevent his wife from injuring herself on the hitherto dangerous route.